An actor seeks revenge against the man who assaulted his wife. Even if the direct structure of The Salesman doesn’t live up to Farhadi’s past works, and even if the film takes some small missteps within that structure, Farhadi’s newest film boldly stands on its own as a work of fury and sadness. A last minute addition to the Cannes Official Selection, The Salesman showed that Asghar Farhadi, after having made The Past (2013) in France, was not about to totally expatriate from his native Iran. After all, too many of his thematic preoccupations pair so well with the problematic aspects of his homeland; any society with strict moral governance will create an environment where citizens may withhold information or bend the truth. And that certainly goes for The Salesman, an angry, forceful film that, while not as masterful as Farhadi’s past work, certainly stands well on its own as an effective expression of the impotence of rage. The Salesman begins as if the gods of tragedy willed the film’s furious plot into motion. In Tehran, an apartment building begins to crumble and collapse without the slightest warning. Rana (Taraneh Alidoosti) and her husband Emad (Shahab Hosseini) must evacuate and find a new place to live. Both are young actors taking part in a small production of Arthur Miller’s Death of a Salesman. Emad, a mild-mannered man, also teaches literature in middle school. Through the help of a member of their production, the couple finds a spacious temporary apartment. Not long after moving in, however, Rana is attacked by a mysterious assailant who believed her to be the apartment’s previous owner. The attack awakens a transformation in Emad, who takes it upon himself to track down and confront the assailant. The revenge is brutal - not Oldboy brutal or Django Unchained brutal - but brutal in a wrenchingly emotional way. With A Separation (2011), Farhadi established himself as one of the 21st century’s finest visual storytellers, a claim that could certainly be supported by About Elly (2009) and The Past, both of which are exceptional works. The Salesman, however, operates on a different narrative level than these films. A Separation, About Elly, and The Past all feature a dense network of characters who have their own motives for sharing, withholding, or tampering with information that’s crucial to a central traumatic event. A woman gets hit by a car in A Separation; a teacher goes missing in About Elly; a wife attempts suicide in The Past. 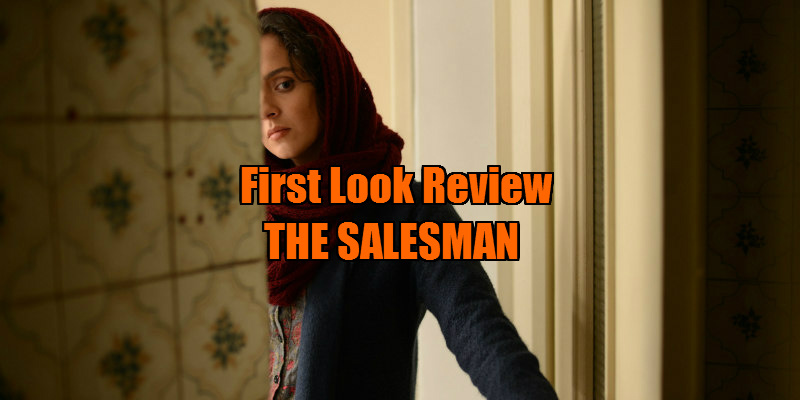 The Salesman also hinges upon a central traumatic event: the assault on Rana. 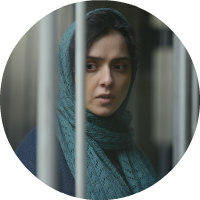 But where Farhadi’s previous films slowly yet naturally arrive at a truth through inter-character scrutiny, The Salesman barrels towards a revelation with fewer characters and a more focused accumulation of angry energy. Scenes of Emad single-mindedly pursuing a car possibly linked with the attack on his wife show, more than anything, the harsh clarity with which Farhadi shapes the film’s narrative. Farhadi’s other works arrived at a truth through a slow lifting of veils; The Salesman arrives at the truth like a ball of fire. By the endings of Farhadi’s three previous films, deception and secrecy are sifted through to uncover some central mystery. But The Salesman solves its mystery - the identity of Rana’s attacker - relatively early on, transforming the purpose of the film from discovering an unpleasant truth to examining how one copes with that truth. In some ways, this narrative shift is what makes The Salesman slightly disappointing. Much of the pleasure of Farhadi’s other films was derived from the richness of their web of finely realised characters, and his newest feels less complex in comparison. But The Salesman does not have the same goals as those films - it accomplishes what it sets out to accomplish, and it does so boldly and clearly. Farhadi is certainly an actors’ director - the way he writes and directs interactions requires his performers to truly inhabit their characters. And The Salesman may be the director’s most actor-centric film yet. Hosseini, a Farhadi regular, deservedly won the best actor prize at Cannes; he smartly makes Emad’s rage come not from a place of morality, but rather a place of insecurity. Alidoosti, who acted in About Elly, manages to give the film a relatively levelheaded voice in the midst of so much passionate anguish. As the attacker, Babak Karimi gives a performance as close to Peter Lorre’s murderer from M (1931) as anything you’ll ever see; his pleading repentance leaves you both sympathetic and ill at ease. Farhadi is clearly interested in performance - not only the great performances he draws out of his actors, but also those in the narrative itself. In making the characters actors themselves, Farhadi draws a smart parallel between the professions of his characters and the roles his characters must perform in their lives as citizens in a society with inflexible moral codes. That being said, the film underutilises the theatrical environment in which Rana and Emad work; the scenes in which they rehearse and perform Death of a Salesman are some of the most interesting parts of the film, but they’re brief and few. The thematic similarities between their theatrical roles and their performances of domesticity could have been exploited to greater effect. Much of The Salesman’s power lies in its examination of how even the mild-mannered average individual contains reserves of anger and violence that know no reason but rather simply exist like blunt facts. The Salesman certainly fits in the subgenre of the revenge drama. 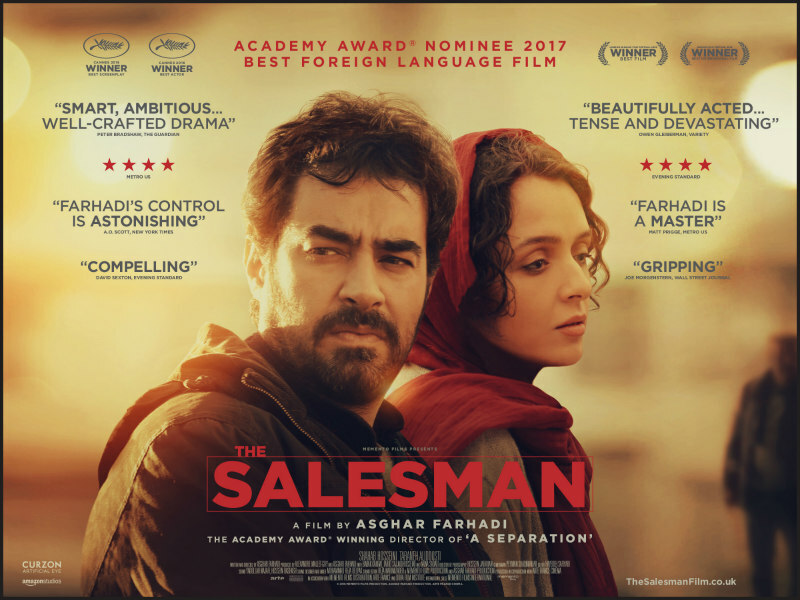 But unlike the revenge dramas of Tarantino or Eastwood that treat revenge as heroic and cathartic, The Salesman represents this action for the poison it really is. In Farhadi’s film, revenge doesn’t salve wounds, it creates new ones: it tragically weakens Emad’s and Rana’s marriage. The impactful irony of Rana’s vocal disapproval of Emad’s vengeful treatment of her aggressor effectively shows that when seeking violent revenge, there are no winners - there is only guilt, mistrust, and self-contempt. Under the larger umbrella of Iranian cinema, Farhadi seems to capture both sociopolitical and aesthetic nuances of Iran in different ways from his contemporaries. The late great Abbas Kiarostami had a feel for the warm browns and clay reds of Iranian cities and landscapes alike in Taste of Cherry (1997), and The Wind Will Carry Us (1999); but where Kiarostami would turn his camera skyward to declutter the visuals and meditate on the quiet ethereality of his characters, Farhadi stays earthbound, letting his characters suffocate in hot red dust in hot brown buildings, stifled by the proscribed morality of Iranian society and the deceit of others. These scorching visuals and cultural neuroses come crashing together in the The Salesman’s final act, and the feverish sentiments the film leaves you with are a testament to its impact. Even if the direct structure of The Salesman doesn’t live up to Farhadi’s past works, and even if the film takes some small missteps within that structure, Farhadi’s newest film boldly stands on its own as a work of fury and sadness. The Salesman was viewed at the 2016 Cannes Film Festival.